Neighbors Fight Back On Rat Mayhem, We Ask Every Building To Sign Up Now! The City is dealing with the worst rat infestation in recent memory. While we are doing our part to encourage a coordinated neighborhood response, and the City is holding classes, AKA the “Rat Academy,” there’s one missing element: City Hall gave other neighborhoods funding that wipes out rat nests. To address this glaring failure, we ask that you call our rep at City Hall, Helen Rosenthal. But sign up for the Rat Academy. We must demonstrate interest to get the attention of the de Blasio Administration. Neighborhood In The Nineties asks our neighbors to step up and join us, along with our elected leaders, the City Health Department and Community Board 7, in a concerted effort to mitigate the rat scourge infesting our streets, parks and subways. We are supporting 3 forums to fight rats. Every building, school and business must get involved. Only by working together in a coordinated effort can we make a difference. This is a training class in mitigating the rat population on the Upper West Side. It’s tactical, nitty-gritty stuff using the best proven methods of such areas as storing garbage, population control, etc. C.M. Helen Rosenthal is co-sponsoring this session with the Community Board. N90s has been working with the Community Board for a good part of the past year to arrange this class. 2. West 90s WORKING COMMITTEE On Rat Control. N90s is working with the Community Board to establish a group of our West 90s neighbors to coordinate efforts at rat mitigation. Ever hear the line about “we’re as good as our weakest link?” Well, in rat mitigation, imagine if eight buildings on a given block get rat-proof garbage cans, but two others, out of laziness or indifference, don’t participate. Their garbage will continue to feed the infestation. This is but one example. That’s why we want to create a constructive working group to pull together a united anti-rat effort. It will also help efforts to get the de Blasio Administration to apply more resources to address the UWS rat problem. 3. RAT ACADEMY. Part 2. No, it’s not a sequel, but it’s a working title for a separate effort between neighbors, the Parks and Health Departments and Community Board 7. That will be the next class. It’s a shame when a rat ran into a baby stroller in Riverside Park; it’s a tragedy when we don’t step up to address this issue and ensure a safer park environment, whether it’s Central, Riverside or Teddy Roosevelt Park. 4. This is not a forum, but it is very helpful. Please contact Council Member Helen Rosenthal and demand that the City allocate rat extermination measures for the Upper West Side. Despite Ms. Rosenthal’s collaborative relationship with Mayor de Blasio, our neighborhood was shut out! We failed to receive the funding given other communities to employ safe anti-rat measures like putting dry ice into rat nests. We must call Ms. Rosenthal ASAP, at 212.873.0282 ext. 200. Ask for Marissa. Demand that Helen push the Mayor to allocate funds for the Upper West Side. Make your voice heard! Wiping out rat nests is a winning strategy. Please dial her today, leave a message if necessary. Tell her we need the rat money immediately. There’s City plans with no funding to attack rat nests, but the Mayor failed us! Riverside Drive Gets The Bumps! The signs are up. The locations for the speed bumps to “calm” traffic on the northbound Riverside Drive service road, between 92nd Street and 95th Street, have been marked. The City contractor assigned to install the bumps will perform the work very soon (in other words, we know it’s about to happen, but don’t have the exact date). 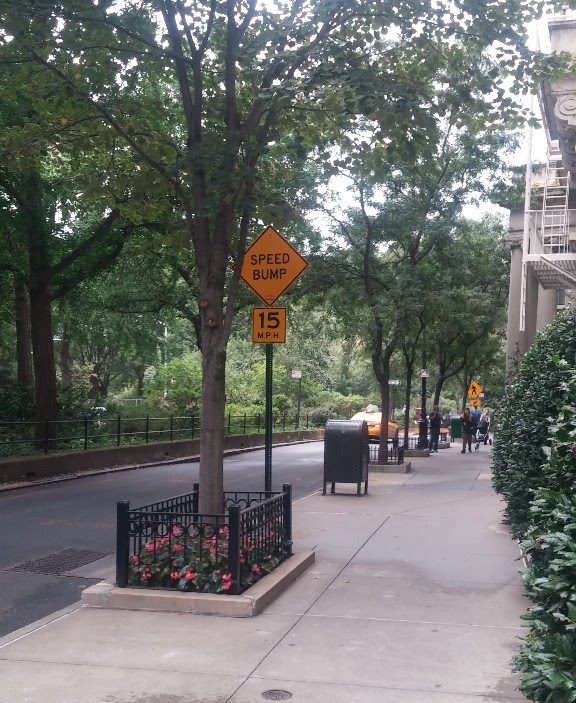 The pedestrian yield signs combined with the soon-to-be installed bumps are the result of three years of work by N90s leaders in cooperation with the Transportation Committee of Community Board 7, the Board itself and the City’s Department of Transportation (DOT). Plans are also in the works for traffic calming measures on Riverside Drive service road between 97th and 99th Streets. While our ultimate goal remains stop signs, it remains a big hurdle due to the DOT’s insistence that we don’t have the required traffic volume. We continue to maintain that the use of Joan of Arc Island and Riverside Park by groups of toddlers from West Side Montessori, Twin Parks Montessori, Goddard School and other nearby nursery programs makes the case for stop signs compelling. We will continue to right for safer traffic conditions throughout our beautiful West 90s community. Comptroller’s report shows $500,000 a night; $3.5M per week for hotel shelters like the Freedom House Shelter on West 95th Street. Enough!